One of the more unique films I've seen lately is Natasha Kermani's Imitation Girl, a sci-fi indie drama that's made a splash on the festival circuit. 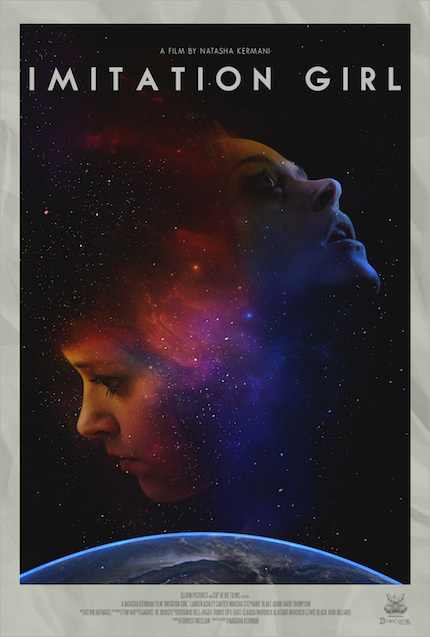 The film stars Lauren Ashley Carter (Premium Rush, Darling, Jug Face) in dual roles --- one as Julianna, an adult film star who's beginning to question her career, and the other as an alien who's taken on Julianna's form. The film has some great reviews online, from blogs to IMDB, and it's easy to see why. It's impeccably made, doesn't overexplain its plot, and is beautifully shot. I spoke to director Natasha Kermani on her feature debut and what that took --- from working with Lewis Black to shooting in uncooperative weather to nabbing an Emmy-winning cinematographer. Imitation Girl is a striking debut. Tell us about the process of how you came up with the idea for the film. Natasha Kermani: I had been developing a few science fiction scripts to produce as my first feature film, but Imitation Girl actually came out of a three-part short series that I wrote, called Imitation Girls, which explored different aspects of female identity through a sci-fi lens. I had been working with Lauren Ashley Carter on a few different projects at that point, as well, and knew I wanted to feature her as the lead — we shot a small proof-of-concept for one of the shorts where she played an adult film star and a robot-version of herself, and we liked how it turned out! The feature version came out of that, and there’s actually a lot from the initial concept that carries through into the feature film itself. At the core of the film is the idea of exploring two halves of the same person, and that we all carry duality within ourselves, a yin and a yang that we’re always trying to balance. I’ve also always been fascinated by the idea of how women are ‘seen’ — and the film is, in many ways, the image of a woman that takes on a life of its own, so she ultimately comes face-to-face with a version of herself. And at the heart of all these big sci-fi ideas is Lauren, who grounds the whole film in a beautiful way. I noticed how beautiful your film is, so I checked out IMDB and discovered that your cinematographer Travis Tips is an Emmy winner! Was it difficult to get someone like him? So I actually met Travis as a freshman in college, when I was PA on a thesis project — it was the very first semi-professional set I’d ever been on! Travis was the gaffer of the project and took me under his wing. I learned a lot on that shoot! We stayed friends ever since and went on to do some smaller projects, including a commercial and some music videos. He also had the best rooftop in Brooklyn and threw the most awesome Fourth of July parties… Anyway, when it came time for me to find a DP for Imitation Girl, I knew I wanted to work with someone I knew would have my back. Trust is extremely important to me — especially on a film that really relies on a tight-knit production team. So I bought him a beer and we had a conversation, and he said ‘Yes!’ He did beautiful work, and I think we had some fun along the way as well. The score is a character in itself; from sweeping strings to low, thundering drums, the film’s music really lends itself to creating atmosphere. In addition to being the writer/director of Imitation Girl, you’re also one of the composers. I’d love to hear you talk about the music and how you worked together with Kevin Hufnagel (the film’s other composer) to settle on themes and explore ideas. I’ve been a musician for a very long time, long before I was making films, and so I always am thinking about the score, even while writing the script. This film in particular was important to me musically as it was actually conceived in part as a musical composition. Part of how I was intertwining the stories during the script writing process was actually inspired by the idea of musical counterpoint, which is two distinct ‘voices’ that interact harmonically and together constitute a piece of music. I saw the two characters, Julianna and her Imitation, as contrapuntal: two sides of a single song, if you will. Working with Kevin was a dream: he’s an incredible musician, and comes from a very different perspective than I do. We quickly agreed that we wanted to create two distinct “sounds” for the two sides of the story — one being the more acoustic, sparse sounds of the desert storyline, and the other more electronic and grunge, for our city voice. Kevin is one of the best guitarists in the world and it was a treat to see him tap into those two distinct identities. We would trade demos with each other (I play violin and would sometimes record over his demo to create the violin melody on top), or we would meet up with our instruments and brainstorm. I love every step (well… most steps) involved in making a film, but I have to say that working on the score with Kevin was really just a joy from start to finish. Indie film directors must often wear many hats, which you did here, of course. You wrote, directed, and co-scored the film. Was it exhausting or exhilarating to fill so many roles? My team and I have always had such a hands-on approach to filmmaking that I almost think it might be more difficult NOT to wear as many hats! Especially with a film like this, the intention from the filmmaker must be crystal clear: that extends far beyond the script and into the details, the rehearsals, the lighting, the sound design, the music, etc. At the same time, I do think there’s a careful balance between being involved at every step and allowing each department head to have their own expression and ownership over the film. Directing an independent feature film requires, in my opinion, an intimate knowledge of how a film is made, from start to finish. I personally love having an in-depth working relationship with all the talented people who are involved. It’s a pleasure to work with people who know their craft inside and out, and through that collaboration you can create some special moments. You’re Iranian-American, and include kind Iranian-American characters, as well as the Farsi language in the film. How important was it for you to include your heritage in your first feature? I don’t think I set out with a specific mission to include Iranian-American characters. Those characters came to be because I knew that I wanted to create an environment that would exist in contrast to the NYC storyline. I wrote them as Iranian-American because that was the culture I had access to and felt I had a personal connection with as a first-generation, Iranian American. All of the photographs and many of the props you see in the New Mexico storyline are pulled directly from my parents’ home or the homes of our amazing actors, Neimah Djourabchi and Sanam Erfani. So it was less about an agenda of representation as it was a very natural process of writing these characters who are, in their own way, “alien.” It felt correct to place our literal alien with characters who were themselves “strangers in a strange land,” and the softness and intimacy they share to exist in stark contrast to how Julianna interacts with the people in her life. What challenges did you have to overcome in filming Imitation Girl? It’s true what they say — there’s never enough time or money. We had a tight shoot schedule and limited resources, and everyone worked very hard to stretch each dollar as far as it could go. We also faced a bunch of weather-related challenges, including being snowed out of two days of shooting in NYC when a February blizzard came through town. In New Mexico, we experienced far colder temperatures than we were expecting, and Lauren Ashley Carter was a hero to muscle through in a very skimpy outfit! We even had to hold production for about an hour at one point because it was hailing in the middle of the New Mexico desert. It was pretty wild, but we were able to create some beautiful, dynamic images of the landscapes by staying light on our feet and adapting to challenges as they came up. Lewis Black is an executive producer and has a cameo in the film. How did he get involved? I had directed a series in 2015 titled The Mentors, written and created by Lewis and Lauren Ashley Carter, while we were developing Imitation Girl, so he knew about the film in the very early days of its development. From script notes to production advice to becoming an EP on the film, Lewis was an incredible supporter of the project from the beginning. He is a great supporter of new voices in entertainment and was a huge part of getting Imitation Girl off the ground and into production! The film is being distributed by Dread Central Presents at Epic Pictures; how did that come to be? We were lucky enough to be invited to last summer’s FrightFest in London, and while we were there we met Shaked Berenson from Epic Pictures. Shaked had just tapped Rob Galluzzo to curate the new Dread Central Presents label and thought Rob might want to see the film — and the rest is history! I tip my hat to Rob for having such a unique and intriguing vision for the Dread Central Presents lineup. He’s done an amazing job already and I can’t wait to see where he goes with it. Is there anything about the film or yourself that you’d like our readers to know? We were incredibly lucky to have such an amazing and collaborative team on Imitation Girl. We were ambitious and made this film against all the odds, and I have so much respect for every person involved with the creation of this film. Everyone who worked on the film is an artist and creator in their own right, so I encourage anyone reading this to check out their work as well — you can find them on our IMdB page. As for me, I’m looking forward to making more genre films in the future and plan to continue ignoring the odds! We’re gearing up for a new film! It’s a period thriller set in medieval England that centers around two women who are struggling to survive on the outskirts of society. I really see it as a dark fairy tale, with horror undertones and a whole lot of gore. I’m very excited about it and can’t wait to share more updates as we move forward with production! If you're intrigued and want something really different, Imitation Girl is available on VOD on March 16 with select theatrical screenings via Dread Central Presents across the U.S. on April 20. Check out the trailer below. Epic Pictures Announces Three New Horror Double Feature Blu-ray Sets From Dread Central Presents!